Rachel Hastings of Byron, a Middle Georgia State University senior graduating with a bachelor's degree in New Media and Communications, has been chosen the President's Scholar for the Class of 2017. Hastings was one of more than 40 MGA students recognized at the 2017 Honors Convocation for their academic achievements. Each year, a graduating senior is chosen by the Honors, Awards and Graduation Committee, with the approval of the University president, to be the President's Scholar. The chosen student must have an outstanding academic record, involvement in campus and/or community service activities, and demonstrate characteristics indicating the promise of a successful future. In addition to Hasting's accomplishments as an Honors Program graduate, she served as president and vice president of the Honors Student Association, a student administrative assistant in the English department, a work study intern for NewTown Macon, and an assistant in the University's Mac lab. She plans to pursue a master's degree in Film Studies. Hastings will represent graduating seniors by speaking at all graduation ceremonies scheduled for May 10-11. Richard Kurhajian of Kathleen, a senior finishing up his bachelor's degree in Aviation Science and Management, was named MGA's 2017 Academic Recognition Day Scholar. The Academic Recognition Day Scholar is chosen each year from an elite group of students who demonstrate high academic achievement and a strong commitment to service to their college and community. Kurhajian carries a perfect GPA. He is employed at Robins Air Force Base as an industrial engineering technician, and has worked in many different areas on base that deal with aircraft on a daily basis. Currently, he prioritizes scheduled maintenance to be performed on mission-critical aircraft supported by the base. As MGA's Academic Recognition Day Scholar, Kurhajian receives a congratulatory letter from the University System of Georgia chancellor and signed resolutions from the Georgia Senate and House of Representatives. Rebekah L. Messamore, Baccalaureate Level Honors Program Graduate, Psychology, B.S. Vicki Lester, Academic Excellence, Public Service B.S. Brooklyn Kilgore, Outstanding Academic Excellence, Occupational Therapy Assistant, A.S.
Rachel E. Hastings, Baccalaureate Level Honors Program Graduate, New Media and Communications, B.A. Brian J. White, Associate's Level Honors Program Graduate, Biology, A.S.
Bianca Wiggins, Outstanding Academic Excellence, Early Childhood Special Education, B.S. Taylor Paul, Baccalaureate Level Honors Program Graduate, English, B.A. Meagan Pittman, Outstanding Academic Excellence, Early Childhood Special Education, B.S. Nicole Sikes, Outstanding Academic Excellence, Business Administration, B.S. Smith S. Meach, Outstanding Academic Excellence, Modern Language, A.A.
Smith S. Meach, Associate's Level Honors Program Graduate, Natural Science, A.S.
Lauren McEachern, Academic Excellence, Health Services Administration, B.S. Charles Speir, Outstanding Academic Excellence, Information Technology, B.S. Heather N. Johnson, Outstanding Academic Excellence, History, B.S. Clayton Vedder, Outstanding Academic Excellence, Business Administration, , B.S. Tiffany LaFollette, Baccalaureate Level Honors Program Graduate, Psychology, B.S. Johnathan M. Merritt, Outstanding Academic Excellence, Air Traffic Management, A.A.S. Rachel Maddox, Outstanding Academic Excellence, English, B.A. Caleb R. Clance, Academic Excellence, Respiratory Therapy, B.S. Rebecca Adair, Outstanding Academic Excellence, Business Administration, B.S. Alexandra Papadopoulos, Outstanding Academic Excellence, Information Technology, B.S. Brittany E. Adams, Honors Discipline Graduate, Business Administration, B.S. Allan Poindexter, Academic Excellence, Information Technology, B.S. Stephanie L. Breitenbach, Academic Excellence, New Media and Communications, B.A. Alexandra Joan Johnson, Academic Excellence, Interdisciplinary Studies, B.S. Michael Ratterree, Outstanding Academic Excellence, Criminal Justice, B.S. Zachary Griffin, Academic Excellence, Middle Grades Education, B.S. Micah Ramsingh, Outstanding Academic Excellence, Information Technology, B.S. Qadeera N. Girard, Honors Discipline Graduate, Aviation Science and Management, B.S. Sarvin Tavakol, Academic Excellence, Business Administration, B.S. Brandon Michael Prosser, Outstanding Academic Excellence, Aviation Maintenance Tech: Airframe and Powerplant, Cert. Jequoyah Knauls, Outstanding Academic Excellence, Psychology, B.S. Jequoyah O. Knauls, Honors Discipline Graduate, Psychology, B.S. Chelsea Bennett, Academic Excellence, Information Technology, B.S. Rachel Brooke Woodard, Outstanding Academic Excellence, Biology, B.S. Randy Mixon, Academic Excellence, Aviation Science and Management, B.S. Dejay Patel, Outstanding Academic Excellence, General Studies, A.A.
Eric Miller, Carol Bloodworth Memorial Award, Early Childhood Special Education, B.S. Cameron Dober, Outstanding Academic Excellence, New Media and Communications, B.A. 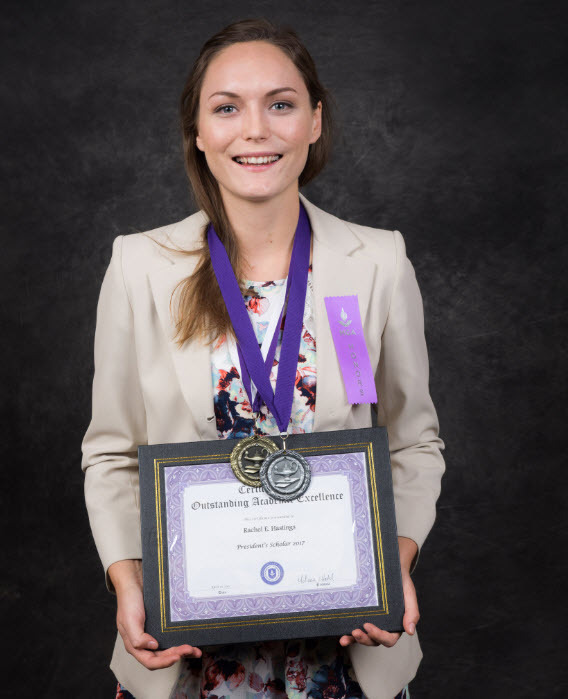 Julianna Zakula, Outstanding Academic Excellence, Information Technology, B.S. Taylor Wilson, Outstanding Academic Excellence, Mathematics, B.S. Jessica LaBouve, Academic Excellence, Information Technology, B.S. Verla Duston, Outstanding Academic Excellence, Business Administration, B.S. Dylan S. Jones. Academic Excellence, Biology, B.S. Kelly Brooks, Academic Excellence, Nursing, A.S.N.